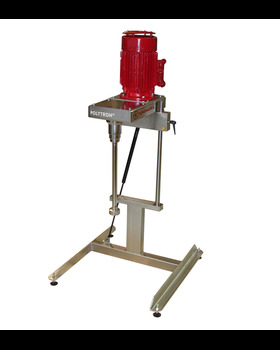 This POLYTRON® is ideal for applications up to 50 liters and for users who need to scale up from research and development to pilot plant or small production scale processes. The aggregate is one of the most important elements when scaling up. This unit has a great deal of versatility in the size and numbers of aggregates that can be successfully used with it. It can accommodate both the smaller laboratory aggregates and the larger ones used for pilot plant and small production applications. This permits the direct comparison of results between the smaller and larger aggregates which makes the scale up decision much easier. This unit has also found great utility for applications requiring the multi-toothed rotor and stator in more viscous solutions because it can supply the higher torque required for turning the rotor at a sufficient speed for efficient homogenizations.